One of the best ways to protect against identity theft is to use strong passwords for all your logins. Strong passwords are passwords that are hard for others to guess. The strongest passwords are randomly generated combinations of uppercase and lowercase letters, numbers and symbols. An example of a strong password is yQn$t2R3#k. It is difficult to create and memorize strong passwords. As a result, many people use names or words or dates that are easy for them to memorize. Unfortunately, these types of passwords are subject to being cracked. It is also common for people to use the same password for every login. This is risky because if someone finds out your password on one login, then they have your password for all your logins. Don't wait to protect your identity. 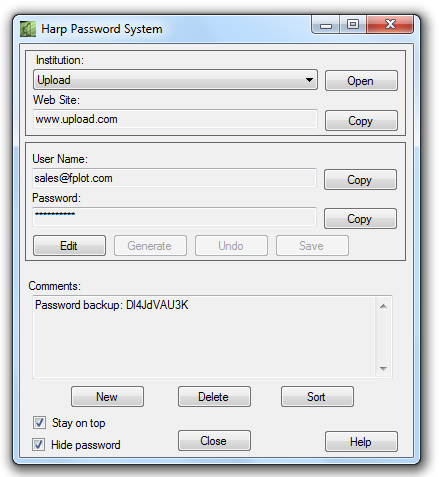 Download Harp Password today! Order details: Buy one user license of Harp Password for $9.95 and you can download and use it on up to three Windows computers. Download Harp Password 30 day free trial. Copyright © 2010-2017 Fplot Corporation. All rights reserved.